God providentially brought the Prettyman family into contact with the Moss family at a summer camp in 2009. Our relationship has grown over the years into a deep love and appreciation. We are thrilled to be uniting forces with this family to win lost souls and see churches planted all across the West Nile Region of Uganda. 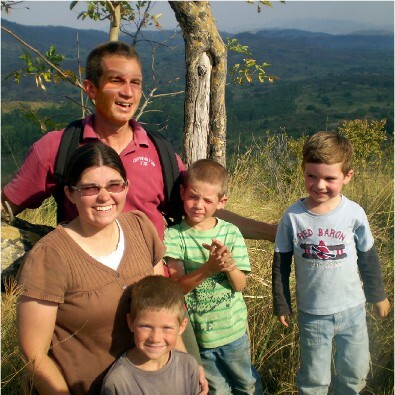 Sam and Nicole Moss came to Uganda in 2012 with their three boys (Levi, Silas, Elijah). They began under the direction of a veteran missionary who had been on the field for over a decade. During the summer of 2014, the veteran missionary left the field and turned the ministry over to Sam Moss. Sam currently maintains several preaching points, pastors VICIBC (Enzeva Village), trains nationals (West Nile Bible Baptist Institute), is working with five nationals in a Bible translation project, and is praying toward starting a radio ministry that will reach the millions of the West Nile Region. Along with this, he conducts the only Christian Camp for teenagers in the WNR. We are eager to come to their assistance in these labors. "We have so much appreciated your faithful prayers and financial support of our ministry! We know it has been a sacrifice for you! You are all so dear to us, and we look forward to seeing how God continues to direct your future. After talking to Pastor Carlson, it sounds like you will be joining us soon in Uganda! We are so excited! We have been praying with you about this for almost two years now (yes, even before you were praying about it). We are convinced that the different gifts and abilities that you have will be a great compliment to what we are currently involved in and will fill in several areas that we have not been able to accomplish." Thank you for taking the time to consider partnering with the Phil Prettyman family! I have known them for several years now, and have been greatly encouraged in my walk with the Lord through his friendship and his ministry of preaching the Word. He has a deep relationship with Christ and a burning desire to draw others into such a relationship with our Precious Savior. Having spent a couple years in the West Nile Region of Uganda, the Lord has directed us to reach out to these dear people through a variety of ministries. Twice now, Phil has joined us for our youth camp, Victory Baptist Bible Camp. We have seen great results each time with numbers of young people trusting Christ, following Him in baptism and church attendance! We look forward to seeing God open other doors of opportunity to reach out to the many youth in Uganda. Believing that an indigenous work will be the most effective and lasting, we are organizing West Nile Baptist Bible Institute where we can offer training to national pastors and church leaders. Besides the classroom, we are burdened to be on the ground encouraging these men and their churches to be fulfilling the Great Commission in their villages and surrounding areas.We are looking to the Lord to enable us to see a church planting movement begun among each of the seven people groups in this region. We are praising the Lord for putting it on the hearts of the Prettyman family to join us in Uganda! There is a great need for laborers in the spiritual harvest field of the West Nile Region, and I believe that Phil's spiritual gifts will be a great addition to the team. As a mature, experienced man of God, he will contribute much to the Bible Institute. With his zeal to be on the front lines, he will be a great mentor to the national pastors in their villages.